Brand new album from platinum, Grammy nominated recording artist Lana Del Rey! 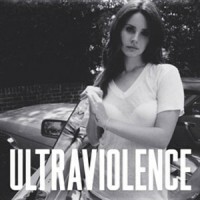 The album features the hit songs 'West Coast' and 'Shades of Cool' along with typically Del Rey-ish songs: 'Fucked My Way To The Top' and 'Pretty When You Cry'. She's not veered to far away from the script of her first album: 50s noir meets Blue Velvet atmospherics meets modern day pop nouse, and if you're a fan then you won't be disappointed. Andy says: Wow! Incredibly, this record is much stronger than Lana's smash debut!? There's no "Video Games", obviously but you don't need it when every track is deeper, darker, grander and sadder than before. A brilliant surprise.